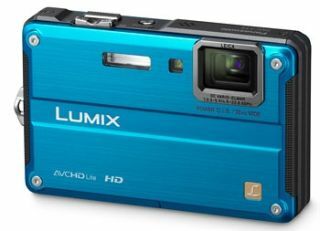 Panasonic has introduced the new Lumix DMC-FT2, which it is touting as a camera for those who love the great outdoors. Well, those who like the great outdoors and are a little clumsy, as the FT2 boasts to being waterproof to 10 metres, shockproof to 2 metres, freezeproof to -10 degrees C and dustproof. Perfect then for those double-hard people who like to take a dip in ice-cold waters with their cameras and dry themselves off with a sack-full of dust. Other features include a 14.1-megapixel sensor, HD shooting capabilities and a 28mm wide-angle Leica lens. Although the camera houses a mere 4.6x when it comes to optical zoom, the FT2 does have something called Intelligence Zoom which brings the 4.6x to a more than respectable 6x. Chassis-wise, the camera is made out of Schwarzenegger-like rubber padding, uses Van Damme-styled reinforced glass and there's also a smattering of Chuck Norris-flavoured carbon resins inside the camera. So your best bet is checking out www.panasonic.co.uk for more details.